A luxury in the past, instant issuance is slowly becoming a must-have. Boston, June 28, 2017 – Instant issuance—printing permanent debit or credit cards in the branch—can reduce customer frustration when a new card needs to be reissued, but relatively high implementation costs have kept adoption of instant issuance solutions low. These days, the cost of an instant issuing solution has gone down, printer quality has gotten better, and pricing models are becoming much more attractive. Could what has been a nice-to-have capability move into the mainstream as banks and credit unions recognize its value? 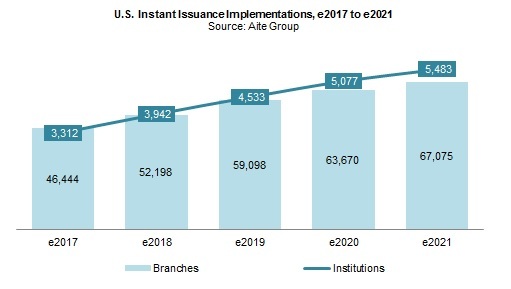 Based on the results of a request for information from six services providers and interviews with vendors, banks, and credit unions conducted in April and May 2017, this report looks at the current market conditions for instant issuance, assesses the market penetration of instant issuance solutions in the U.S., and gives executives at banks and credit unions insight on the business case and cost for deploying an instant issuance solution. This 23-page Impact Note contains nine figures and four tables. Clients of Aite Group’s Retail Banking & Payments service can download this report, the corresponding charts, and the Executive Impact Deck. This report mentions CPI Card Group, Entrust Datacard, FIS, Fiserv, Gemalto, and Oberthur Technologies.